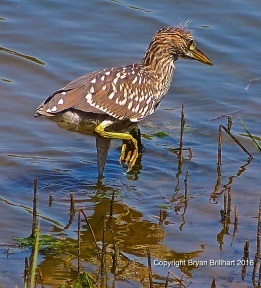 Bryan Brillhart Photograph Presents Dig Imperial Beach "Bird of the Week", the "juvenile Yellow-crowned Night Heron"
Bryan Brillhart of Bryan Brillhart Photography presents us with the Dig Imperial Beach “Bird of the Week”. This week’s bird is the "juvenile Yellow-crowned Night Heron (Nyctanassa violacea}"
yellow legs, and a slaty blue-gray body with "shaggy" feathers on back and wings.They usually nest in small colonies, sometimes with other wading birds, and forage along tidal marshes, in tide pools and the shores of water bodies where crustaceans are abundant. The great majority of the Yellow-crowned Night-Heron's diet consists of crustaceans. They eat many kinds of crabs, including blue, ghost, and fiddler crabs, as well as crayfish. Other prey include insects, fish, snails, earthworms, marine worms, and leeches. Occasionally they've been found eating lizards, snakes, young birds, mice, and small rabbits. Foraging birds stand still or slowly stalk crabs and other prey along shorelines, marshes, and fields. Once in striking range they lunge at their prey and seize it in their bill. 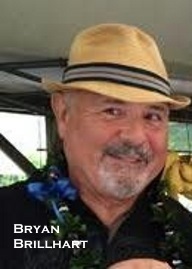 They swallow small prey whole, but often shake apart, crush, or spear larger prey. They forage on their own, typically keeping other individuals at a distance of 15 feet or more. Courting Yellow-crowned Night-Herons make display flights around their colonies, sometimes with the neck conspicuously extended. Courting pairs make a neck-stretching display, slowly raising and then quickly pushing the head back between its shoulders, while fanning the long shoulder plumes. Males do this first and females sometimes follow. horizontal limb, often hanging over water. The female stands on the nest site while the male carries sticks to her as part of the pair-bonding process. As the nest comes along, the female begins to gather sticks as well—the birds typically strip sticks from the limbs of dead trees rather than gathering them from the ground. Sticks can be up to about 2 feet long and 1 inch thick. The twig nest is sometimes lined with leaves, vines, or Spanish moss. The nest takes about 11 days to build initially, night-herons use them for several years, adding to them each year. Nests can be 4 feet across, with just a shallow depression inside for the eggs. This is a beautiful bird that is eagerly sought by wildlife photographers. 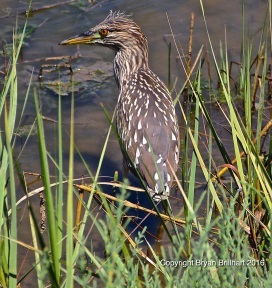 We are lucky to have the Yellow-crowned Night Heron among the many diverse species to enjoy in our own Tijuana Estuary. Take a walk on the many trails there, and you may spot this beauty.